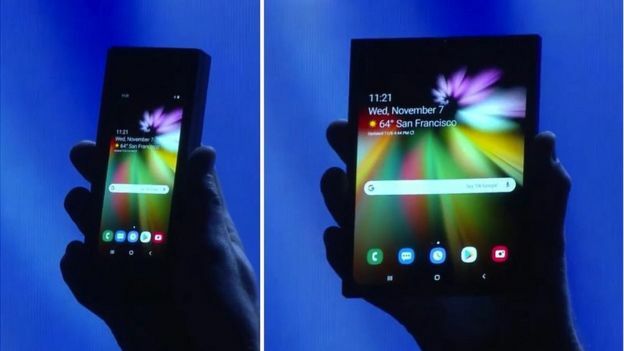 Samsung recently unveiled news of its first folding smartphone but no one got up and personal with the device. From afar spectators got to see what probably is a first of its kind. Samsung plans on releasing their new folding smartphone somewhere next year. This event was a chance for developers to start with making apps that are folding- smartphone- compatible. This folding Smartphone could be Smasung’s saving grace as their profits have shown a drop in their mobile division. It could also signal a start for Apple customers to move on from their products and switch on to Samsung. Will the Foldable Smartphone be really worth it? With Foldable Smartphones you get the screen of a tablet in the size of a gadget that can fit into your pocket. But is the size of the Foldable screen really worth it given it enormous retail price? The prototype showed off at the Samsung event measured 7.3inches diagonally or 18.5cms if you prefer. Up close the foldable smartphone resembled an extremely thick phone but as mentioned earlier no one was allowed to touch it. But will this be the only Foldable Gadget? Apparently several Android manufacturers are well on their way to making many foldable devices all set to release somewhere next year. There were already talks that Samsung planned on releasing their new smartphone device next year but whether that will be the much awaited foldable smartphone is a big question mark. Also present at the foldable smartphone event was Google who also promised to bring more features compatible with the foldable Smartphone. Samsung too is all set to start mass production of their latest foldable smartphone release in the coming months. This event was a chance for app developers worldwide to start making apps that will be compatible with the new foldable smartphone. The fact that Google was present too suggests that this new foldable smartphone will be taken seriously at least in the app department. Like any company, Samsung too wants their foldable smartphone to be a hit. But analysts are not so sure this will be possible. According to analysts, shoppers may find the gadget a little too thick to like using it. The second negative factor is that the foldable smartphone ain’t going to come cheap. This factor coupled with the previous one will make the foldable smartphone a little less successful than initially anticipated. Given all the negatives, Samsung will have to show people that the phone is not just a gimmick but will in fact increase their productivity. Although the foldable smartphone may have its charm in the shape of an increased phone screen size, the initial wow factor may slowly dwindle once people realize that the foldable smartphone is not really worth the price. By the looks of it Samsung has invested a lot in its foldable smartphone by making a lot of investments by way of new manufacturing processes and machines.